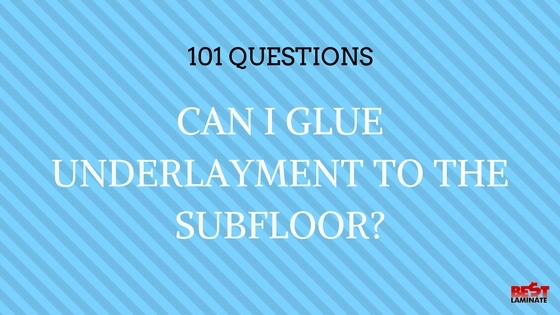 Home >> 101 Questions Series >> 101 Underlayment >> Can I Glue Underlayment Down On My SubFloor? The question of whether you should glue underlayment down to a subfloor may come up if you are installing flooring for the first time. You want to make sure you have a solid foundation for your new flooring. You would think this would extend to your underlayment. Should I Glue Underlayment Down? No, you should not glue down your underlayment. Underlayment is is a floating material, the same as your laminate flooring. In most cases, you should not glue or nail your underlayment down. You should always check with the installation instructions of the underlayment for proper installation instructions first. Learn more about installing underlayment here. If plank vinyl flooring is waster-proof, why is a vapor barrier recommended? if on a concrete slab where moisture intrusion is suspected?Also, is 6 mil poly good for this? I’m looking at all the choices for underlayment. This is a working studio, new construction on wood with a crawlspace and moderate humidity. My primary concern is cushion and not noise reduction. The flooring will be VCT tile. Does cork underlayment really provide a cushion? My current studio has VCT tile, moisture barrier over concrete. It is really hard on my legs and back. I’m getting older and want to make the best choice this time around. I have Gel Anti-fatigue pads in the place I stand the most but the new studio is much bigger and I’d have to get 4 more just to cover the same workstations. They are expensive and UGLY so I’d like to just make my floor better everywhere instead of having them spread around even if it costs more. Also, is 6mm cork significantly more cushion than 3mm cork. Is there anything better than cork? Since VCT has no locking, isn’t floating and is glued down, I’m thinking a glue in product would be best. Hi Tammy, thanks for reaching out! Here at Bestlaminate, we do not carry VCT tile flooring so we do not have recommended underlayment options for that application. We do offer luxury vinyl plank flooring, and with that, we would recommend Floor Muffler LVT Ultraseal Flooring Underlayment. It is a high-performance acoustic underlayment and moisture barrier, that will provide some cushion for your flooring, perfect minor subfloor imperfections and help reduce foot fall noise. Keep in mind, that vinyl is a hard surface so there is no way to really provide additional cushioning beyond what underlayment can do. Would you like us to send you samples of our underlayment options so you can feel the difference?